Sometimes I'm a bit sheepish to get my camera out when we're off on one of our adventures. It's a bit awkward to take pictures of your plate of food at a restaurant. Or stopping in the middle of a crowded sidewalk just to get a good shot. And especially when trying to grab a picture of someone other than those you're traveling with. But other times, I thank my camera for being a bit of a conversation crutch. Last weekend at the Indiana State Fair, my husband ordered a corn dog. When I heard the cook yell out from his cart, "It'll be a few minutes, we make 'em fresh!" 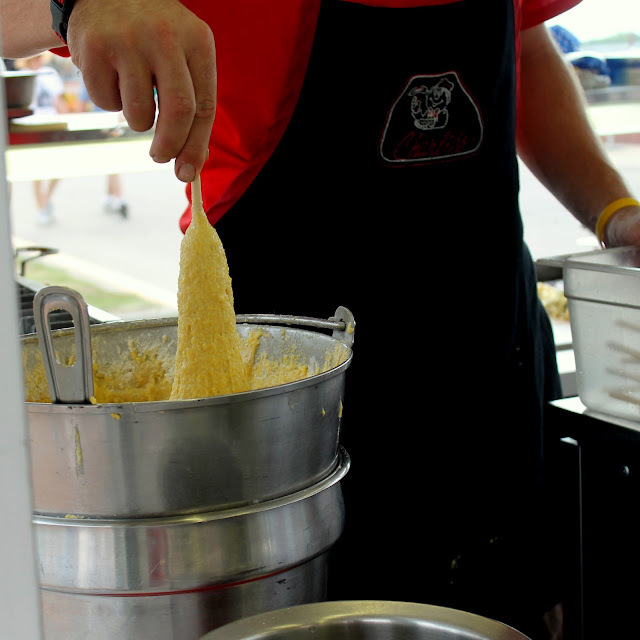 I had to grab my camera and see if I could take a peak at the process of making a corn dog. When he saw me trying to get a shot or two, he invited me to the back of the cart where he opened a window so I could get a great look at him making it. He was clearly so proud of their corn dogs and their process, and the time he spent telling me about how to make this classic fair food was a highlight of our trip to the fair this year. 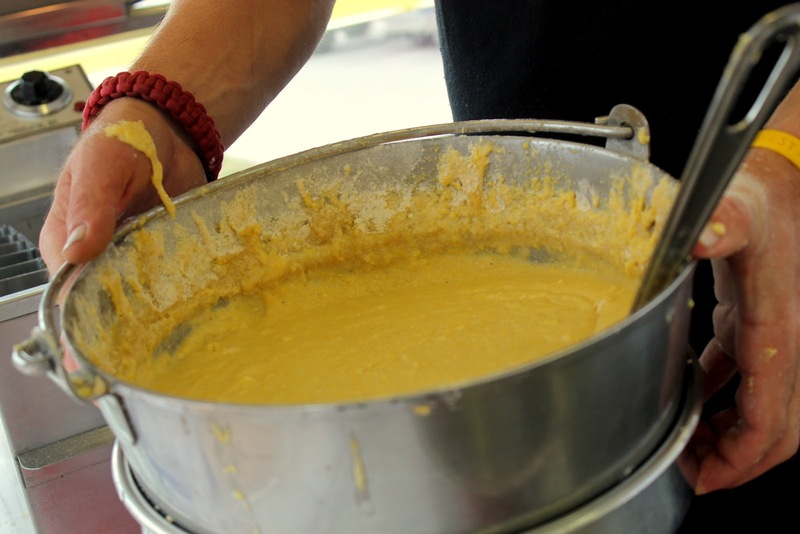 He started off by mixing up the corn cake batter. It smelled heavenly, a sweet, right-off-the-cob aroma. Then he dunked the hot dog right into the batter. One plunge in, and it was coated at least a 1/2 inch thick. I couldn't believe how thick and sticky it was. 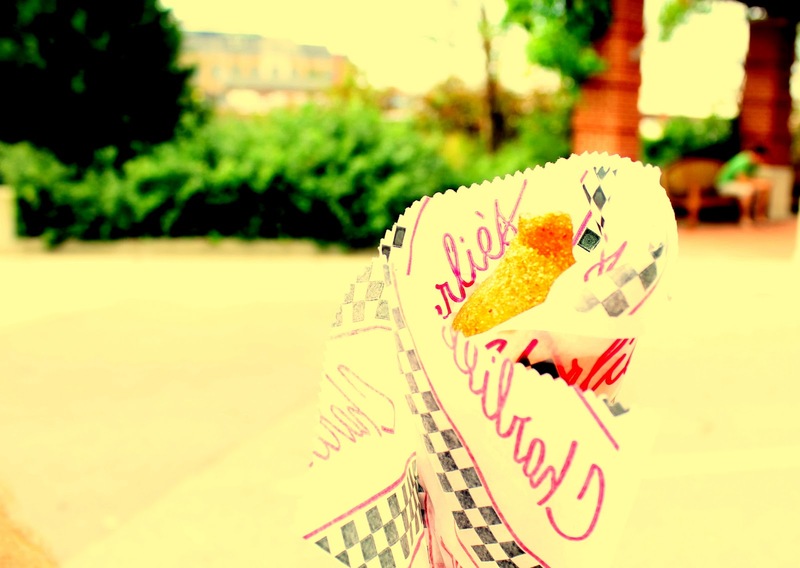 And after a few minutes of chatting with him, our corn dog was ready. I probably could have tried for a better picture, but I was too busy eating (and pushing a stroller... and digging out a pacifier from my purse... and answering Big Arrow's 900th question...). Many thanks to the kind man at Charlie's corn dog stand on the northside of the Indiana State Fairgrounds. 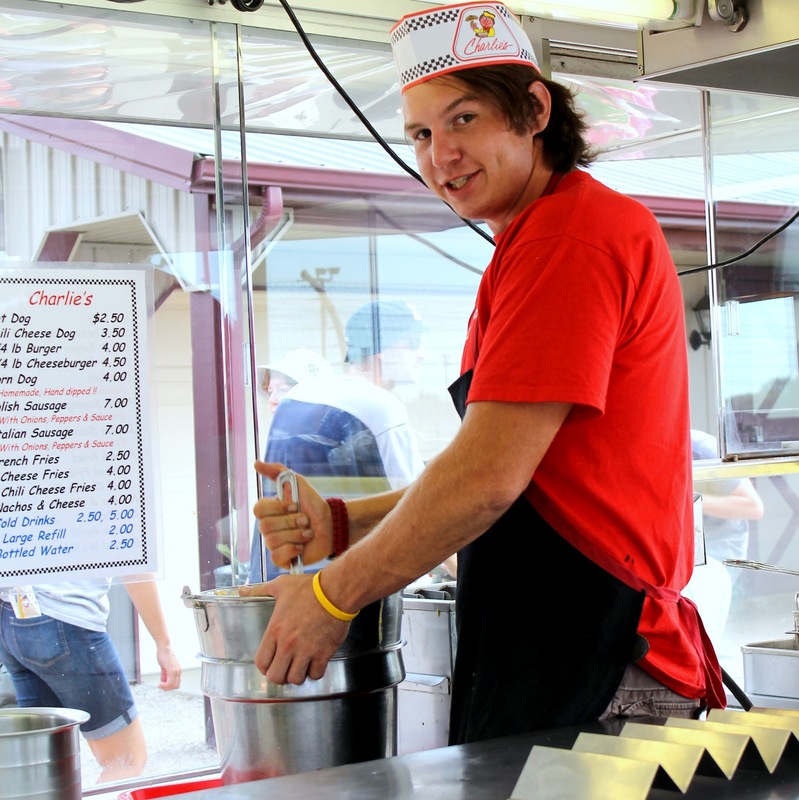 He claims they're one of the few vendors at the Fair who freshly prepare their corn dogs. I can't vouch for whether that's true, but it definitely was the best I've had in a while. Regardless, he's certainly the most personable corn dog vendor I've met. Fair food. How I love it! Got into corn dogs last summer. Still don't know how they get so much of the batter to stay on though. Oh man, now I'm craving corn dogs. That looks delicious. I had a great time at the Fair and the Corn dogs are so delicious, you gotta spoil yourself a little bit there despite the calories. The is so much to do so you end up burning the calories anyway, while having a good time with friends. 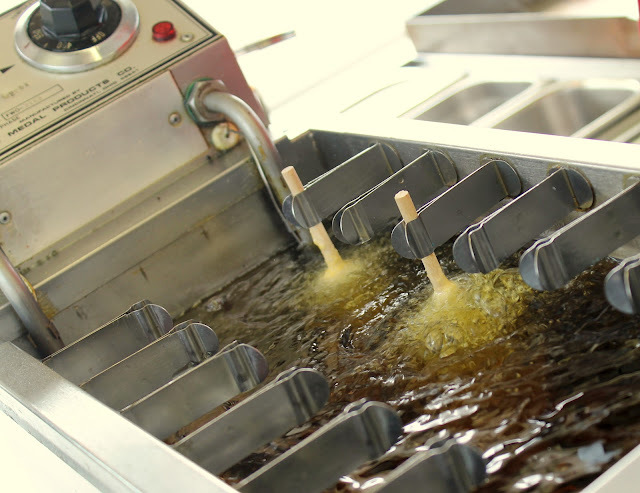 Not the biggest fan of corn dogs, but it is really cool how they make them. I think if they dipped it in chocolate instead of corn, they'd have a winner.